The Theosophical Society was founded in New York in 1875 by a group under Helena Blavatsky, to promote a 'universal brotherhood of humanity'. The Society encouraged the study of religion, philosophy and science, and the exploration of the unexplained laws of nature and the powers latent in human beings. In 1891 Colonel Olcott, one of the co-founders, visited Sydney and Adelaide, where he established branches, or 'lodges'. Solicitor Nathanael Knox, the inventor A.W. Dobbie, James Mackenzie, botanist J.G.O. Tepper, W.B. Rounsevell and others were early local members. Meetings were first held in a room in Molten Street, but in 1914 the Society built rooms in King William Street in memory of Knox. 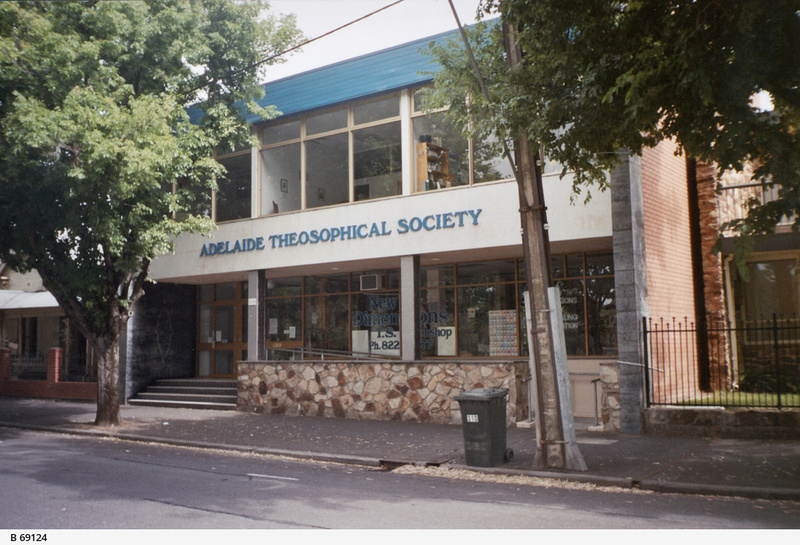 In 1996 the Adelaide branch moved its library, bookshop and lecture hall to South Terrace.